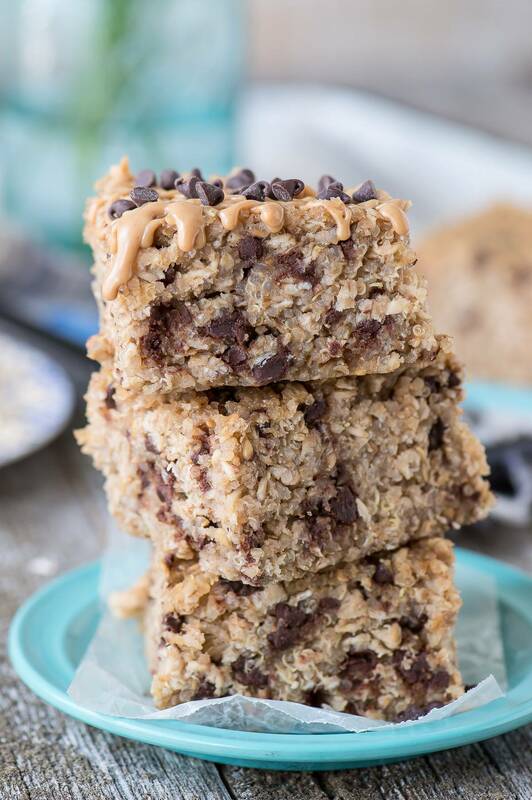 Healthy peanut butter chocolate chip quinoa granola bars! 7 ingredients and 30 minutes to bake! The best homemade granola bar! 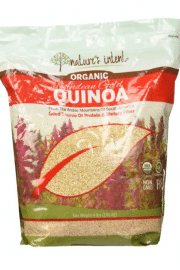 When quinoa came on the scene a few years ago everyone was raving about it. Having a gluten allergy and learning how to live off of rice (and potatoes & chocolate!) I was all for incorporating it into my diet. We tried quinoa taco skillet, quinoa stuffed peppers, quinoa in soup, quinoa oatmeal, quinoa chili.. we never ventured as far as quinoa burgers, because this girl likes her meat. While quinoa in soup or chili is one of my top favs, the best thing to make with quinoa is a pan of chocolate chip quinoa granola bars!! My go-to recipe involves preparing the quinoa in advance then combining all of the granola bar ingredients, mixing them in a bowl and baking the bars in an 8 inch square pan. 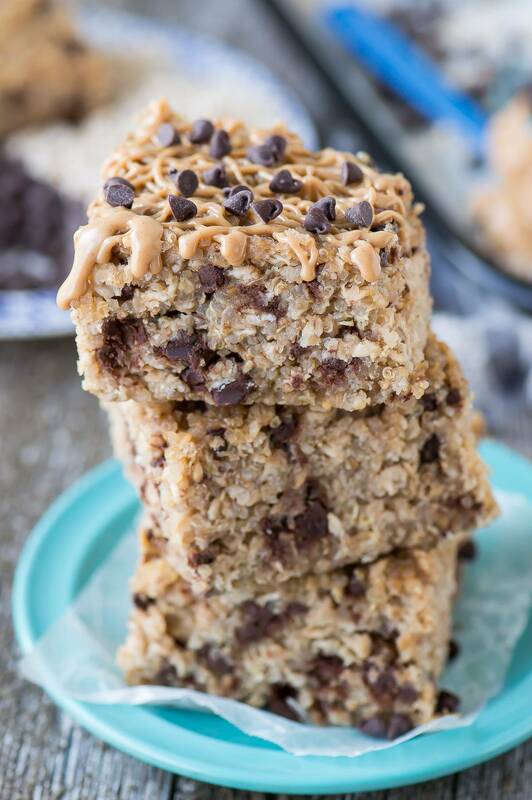 Of course I love this recipe because there’s peanut butter and chocolate chips, and it tastes just as good as a snicker’s bar but is 1000% healthier. Another thing about our recipe for Chocolate Chip Quinoa Bars is that they turn out moist! I know moist can be such a weird word, but sometimes you want a more moist granola bar, versus the pre-packaged ones that leave you needing a glass of water. 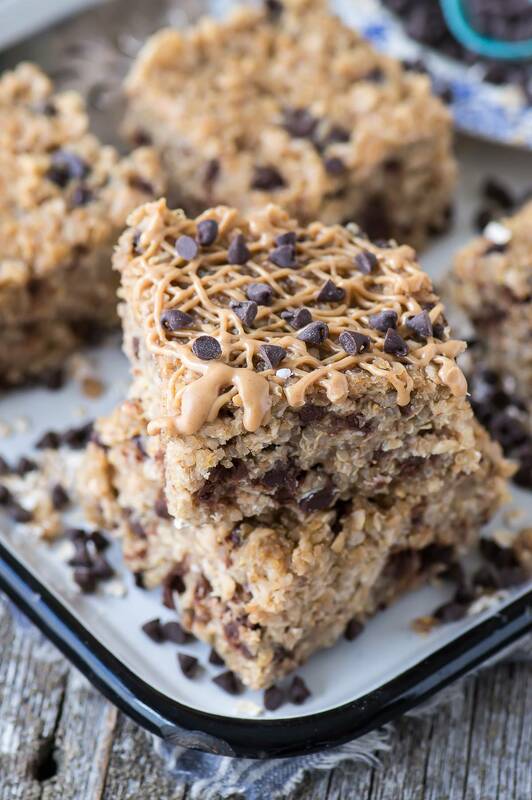 I’ve made this same exact Chocolate Chip Quinoa Bars recipe probably 15 times and I never get tired of them. I’ve even forgotten the honey once, and I learned to never forget it now because I do like the sweetness it adds. I’ve eaten these for breakfast, snack, and even packed them to take while traveling. I love them as a pre and post work out snack or even a bed time snack. 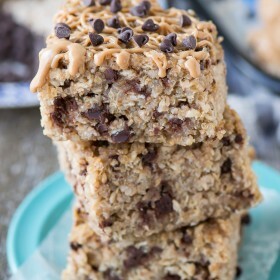 If I’m really fighting a tooth sweet craving, I’ll drizzle melted peanut butter over a bar and add mini chocolate chips! Seriously, these Chocolate Chip Quinoa Bars are good. 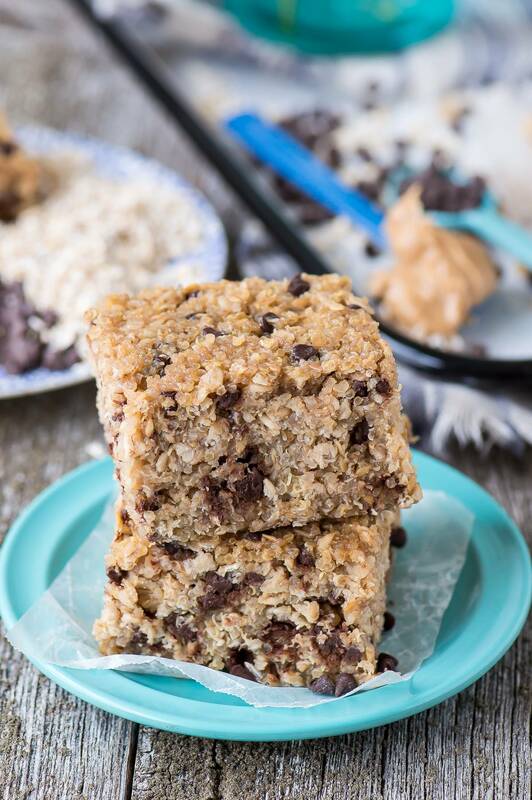 I’d love to have a batch of these quinoa bars on hand for when afternoon hunger hits! Do you have the nutritional value of these? What could I use in place of the flaxseed? I have everything but this. 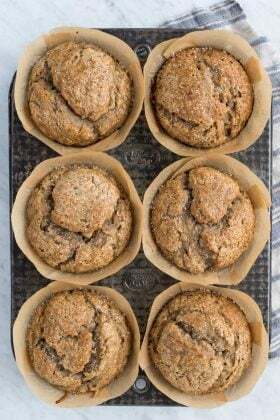 Would chia seed work to fill the bulk or does the flax play an overall role in the recipe? Hi Shannon! The flaxseed is added for it’s healthy benefits so substituting chia seeds would work! 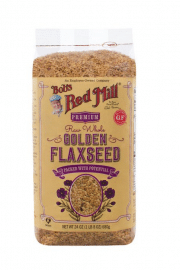 Can I use ground flaxseed? If so, how much? Hi Matt! I would think that would work! I made these but they are falling apart and not staying together like a bar. Any chance you know what I may have done wrong? Hi Chelsea! Hmmm.. did you bake them along enough? Mine are always thick and stay together! Do you have to use ground flaxseed? Nope! You can omit it! Hi, I just recently discoverd PB Fit and I’m wondering if I can just sub the powdered pb + water for regular peanut butter? Can’t wait to try this recipe! Hi Amy! I’m not sure how PB fit works – can you use it to make regular peanut butter? Any feedback on using coconut milk? Hi! 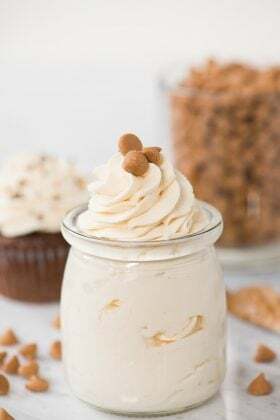 I love this recipe but ended up changing it a bit due to what I have and not wanting my son to have chocolate , lol. So for the flax and choc, I used flax, sunflower seeds, pumpkin seeds and shedded almonds to make a full cup. I also used agave instead of honey which I am regretting but the other subs seem great! So my concern is that I dunno how to save them. It makes a lot. And I know we won’t eat them super fast. 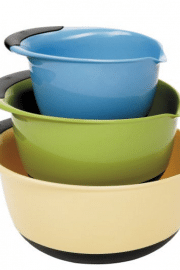 So do u put these in Tupperware, the fridge or how do U store generally and how long do they last? And if you get to the date where they would go “bad” can you freeze? 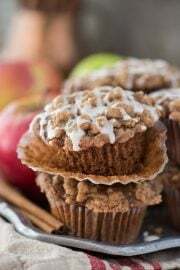 I would just love to have these on hand all the time and plan to make myself a batch just like you suggest and so storage is a concern. Lmk if you can and thanks! Hi, checking to see how these should be stored and could they be frozen if we don’t eat them all!? Hi! 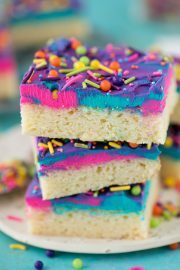 Making these for a softball tournament tomorrow! About how many bars does this make? Wondering if I should double or triple the recipe!? Hi Jenny! It definitely depends on how you cut the bars – but if you’re feeding a whole team, I would definitely double the recipe and make it in a 9×13 pan. Delicious! I subbed Cocoa powder for the chocolate chips to lower the sugar and add the health benefits. We love them! They aren’t as sweet,I’m sure, but we don’t eat much sugar so we don’t mind. Thanks for the recipe!! The recipe calls for steel cut or quick oats. Did you mean rolled oats? I imagine steel cut would be very hard as they are nothing like quick oats. Unless of coarse, you would cook them first but then that would add a lot of moisture! How much cocoa would you sub for the chocolate chips? 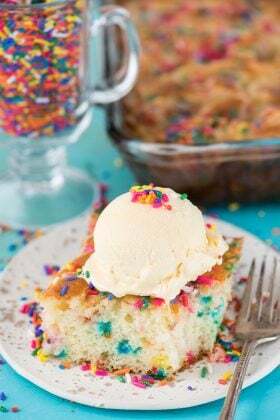 I’m definitely making this tonight!!!!!!! So excited because i think my daughter will really enjoy it. Would you happen to have the nutritional information on it? These are so delicious!!! But I too am finding they’re not sticking together and very crumbly. Would adding more PB and honey help? Or was the quinoa not cooked enough (first time I’ve touched it)? Mine were crumbling also. And I added more peanut butter . Hi Lori! They definitely should not be crumbly. Could you have over baked them? Mine were very crumbly too. I wish I had used a differ not pan than the 8 x8 which made very thick bars. Also, the would not characterize this recipe as a granola bar wannabe. They tasted good… but we’re a crumbly mess. I wondered if really packing them down in the pan would have made a difference ( but they were packed pretty well). I think a larger pan would have helped. It was not what I expected. Oh no! They definitely shouldn’t be crumbly. Let me know if a larger pan made a difference!